Those of us who care about the earth and the future of humanity know we need better leadership. The ancient Daoist oracle, the I Ching, offers guidance for coping with change, and the wisdom of the I Ching is still relevant today, after three thousand years. The I Ching has sixty-four hexagrams, and each is a short story, or scenario. Within the hexagram, each of the six lines offers an attitude that will bring success or failure. The hexagram to address the question may be chosen by tossing yarrow sticks or coins, or the questioner may choose a random hexagram. I have chosen Hexagram Seven, which addresses the matter of leadership. This hexagram, and the subject of leadership, will determine whether we can solve the many problems we face. The whole issue of leadership has been muddled with politics, each side arguing with the other, and each side blaming the other for bad leadership. Hexagram Seven would set us on the right path, if only we learn its lessons. The introduction to Hexagram Seven says, "To be an effective leader, one should train the members of the group to be mature and responsible." This is the idea of mentorship, which is lacking in many circles. Some leaders want all the power for themselves, but this goes against the Dao. When leaders fail to train younger, or newer people for leadership, they weaken the system. We need leaders who are generous with their power, who are ready to share responsibility with others. The introduction also says, "the commander of an army must be able to trust the soldiers and rely on them to make decisions and carry out orders." Trust comes from sharing. Leaders who are greedy with their power, who refuse to share it even with their closest associates, ultimately find themselves surrounded by people who envy them, who cannot be trusted. Leaders need to teach as well as lead if they want their associates to learn how to make good decisions and act responsibly. "The first line, yin, shows that harmony in the group is essential. If an army is disorderly, it cannot fight properly, even for a noble cause." Leaders must lead with generosity, compassion, and courage. If they practice good leadership skills, such as those described in the classic book, How to Win Friends and Influence People, by Dale Carnegie, they can create harmony and order among those they lead. Dale Carnegie published his book during the Great Depression, in 1936, and it helped millions of people become better salespeople, better managers, and better executives. Carnegie wrote about how to create genuine business relationships, listening and taking ideas from employees, and treating them with respect. Carnegie's book was not about humiliation or scaring people into submission, as we see so often in today's workplaces. Carnegie's principles are progressive for any group, at work or at home. "The second line, yang, shows the leader involved in the action, giving out orders side by side with the troops. His or her participation encourages the other group members." This line of the hexagram cements this notion. To create harmony, a good leader works side-by-side with those he leads. The leader is not shut off from the action. A boss who gets down in the mud like everyone else creates a bond with those he leads. A good leader makes people want to cooperate. One of the best tools for invoking cooperation is old-fashioned brainstorming. A brainstorming session is egalitarian. Everyone in the session is equal, because everyone is there to contribute ideas. Even weak or undeveloped ideas are welcome, because small ideas can spark someone else to think of a bigger idea. Plus, everyone in a brainstorming session feels energized to do their part to make the vision a reality. "The third line, yin, compares the misfortune of losing a soldier in battle to the unfortunate situation of losing a group member or leader who chooses to act foolishly." This line is a warning, showing how wrong action results in loss. The hexagram shows how a foolish leader is like no leader, a leader who may as well be lost in a battle. All the hexagrams contain at least one line predicting bad results, but that does not mean you are destined to get that result. The meaning is to study your situation for what could go wrong and adjust your attitude to make the best of a situation. The purpose of this line is to make us realize a foolish leader is just like having no leadership at all. It's a tragedy, like losing a soldier in battle. "The fourth line, yin, shows the army resting at a camp in the distance. The wise leader treats people well and encourages team members to balance work and rest. There is no fault in this." Workaholic leaders go against the Dao, according to Hexagram Seven. The I Ching clearly states: a wise leader encourages team members to balance work and rest. This is a warning to those of us who tend to throw ourselves at a problem relentlessly and never rest. This is bad leadership, because we tend to ignore our other responsibilities to friends, family, and our own body-mind-spirit. Take it from this ancient oracle—when the whole world is falling down around us, stressing just makes it seem worse. To be whole, we must have time off from stress. This is the purpose of meditation and good self-care habits. "The fifth line, yin, shows rodents destroying crops. Immature leaders would lose soldiers even on such an easy assignment. Never appoint an unfit person to any job." This line is another warning: never appoint an unfit person. The best leaders have experience and knowledge for the job. A smart leader in an agricultural society would have studied methods for fighting rodents, such as using a controlled fire to drive them out. An unqualified leader might go to battle with rats and botch the whole thing, even sustaining casualties. We need good leaders who know what they're doing. "The sixth line, yin, shows a great ruler choosing his/her heads of state. If he or she appoints greedy, inept executives, the people will loose respect and the country will fall into disorder." In ancient times, the rulers chose the heads of state, but in modern democracies, we choose. Or at least that's how it's set up. In America we are currently in a predicament with bad leadership, including plenty of arguing about it. However, it's the vacuum of qualified leadership that keeps the dysfunctional system in motion. One thing we can do is learn leadership skills ourselves and help lead our immediate circles humanely. Good leadership can spring up from the grass roots, which means it grows organically. Instead of becoming cynical or apathetic, we can attend to what's in our own yards. If more people do that, grassroots can fill the vacuum of leadership to promote patience and healing. Looking to the I Ching for guidance helps us form better attitudes, and make mature decisions about what to do in particular situations. For politics, instead of feeling jaded, we can take action. It may mean calls and emails, signing petitions, donating to causes we care about, participating in demonstrations, and voting. In our private lives, it may mean forgiving a friend, rekindling a relationship or making new friends, repaying a debt, lending a hand, or making amends. Consult the I Ching for ideas that lead to clear thinking and a positive mental attitude. To read your I Ching online, go to surrealist.org/iching - it's free, and it can set you on the path to positive changes. This essay originally appeared in Sedona Journal of Emergence, 2018. The I Ching is the ancient Taoist book of metaphors, written to offer guidance in the inevitable changes of life. 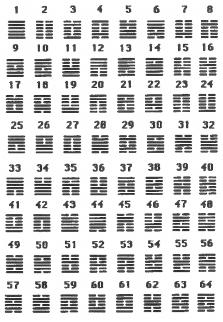 The I Ching consists of sixty-four hexagrams, the number of combinations mathematically possible with six solid and broken lines. The broken lines "- -" are yin, or passive, dark, yielding. The solid lines are yang, active, light, reaching. Ancient Taoist scholars recorded meanings for each of the sixty-four combinations. Your future is in your hands. Consult the I Ching for ideas that lead to clear thinking and positive mental attitude. The I Ching teaches you to flow with changes. Create positive change from the inside through conscious living. Take the time to reflect on your attitudes and ideas. This interpretation of the ancient text I Ching has been online since 2000. Thousands of visitors have accessed the oracle through Surrealist.org. Now it is available in a take-home Kindle edition. Celebrate change and learn to flow with it instead of resisting it. See Learning to Flow with the Tao at Amazon.com—click here.